Paris: Heavy snowfall and deadly blizzards lashed Europe Thursday, forcing airports to cancel or delay flights around the continent, as a deep freeze gripped countries from the far north to Mediterranean beaches in the south. 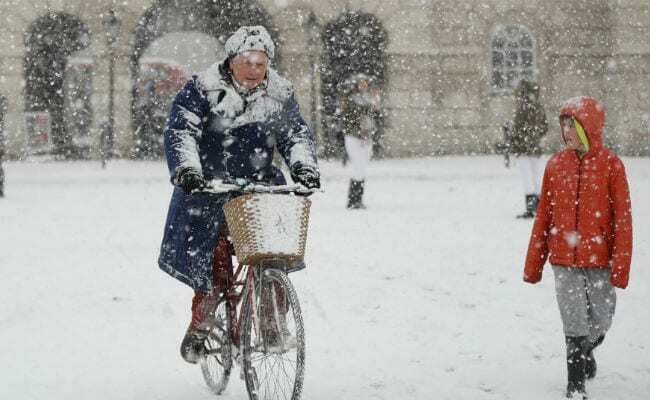 The snowstorms, unusual for much of Europe at this time of year, left roads blocked, thousands of drivers stranded and schools shut, with weather agencies predicting the biting cold would continue in parts of the region at least until Thursday evening. In Slovakia, exposure to the cold has claimed the lives of seven people since Sunday, the Medical Rescue Service told AFP. There have also been six deaths in the Czech Republic in recent days, five in Lithuania, four in France, three in Spain, two each in Italy, Serbia, Romania and Slovenia, and one each in Britain and the Netherlands. The Siberian cold front -- dubbed the "Beast from the East" in Britain, "Siberian bear" by the Dutch and the "snow cannon" by Swedes -- on Thursday forced Geneva airport to close for several hours in the morning, with temperatures plunging in Switzerland to nearly minus 40 degrees Celsius (minus 38 Fahrenheit) at higher altitudes. Scotland's Glasgow airport closed its runway, while Edinburgh airport said several airlines decided not to fly because "they do not have the critical mass of staff needed to run operations securely". Snow forced the cancellation of all flights at Dublin airport, with services not expected to resume until Saturday at the earliest, and strong winds led KLM airlines to cancel or delay dozens of flights into and out of Amsterdam's Schiphol Airport. Eurostar also pulled four of its international services on Thursday, connecting London, Paris and Brussels, with further cancellations announced for Friday. Though some people enjoyed an outing in the cold, those who donned their ice skates risked discovering the waters were not frozen enough. A 74-year-old man who fell through the ice on a pond near Bruges remained in hospital in critical condition Thursday, a Belgian TV channel reported. Snowfall in northern Italy forced the cancellation of 50 percent of regional trains, while in the city of Naples, schools were shut. In Paris, which awoke Thursday under a blanket of snow, authorities continued operating emergency shelters for the city's roughly 3,000 homeless. Authorities urged people to look out for elderly relatives and neighbours after a French woman in her nineties was found frozen to death outside her retirement home. Sales of the "martisor" good luck charms plummeted, along with the temperature.